Options Management Recycling Equipment Big Hit is Scotland! Our MD Paul Ure was excited to meet Nicola Sturgeon at the Scottish Grocers Federation Conference in Glasgow today. The First Minister of Scotland was impressed by the capacity and versatility of our Envipco Flex, the RVM with the smallest footprint on the market for collecting plastic bottles and cans for the Deposit Return Scheme. Options Management’s Reverse Vending hits the Headlines! Options Management hit the headlines recently when the Sentinel newspaper featured an article in their business section sharing an overview of the company and highlighting our Reverse Vending equipment and the trials we are running with the Co-op at major music festivals this summer. Please find below a link to the story. Everyone’s a Winner at LACA! Thank you to everyone who came to speak to us at the LACA exhibition. We had a great week catching up with old friends and doing business with new customers from the educational catering sector with our Free School Compliant Drinks Fridges and Recycling Units for bottles and cans proving particularly popular. Below are Sue Smith (Doncaster Schools), Koran Hurst (HC3S) and Paula Blachard (Taylor Shaw) who were winners of Options Management prizes on the H2O Educatering “Wheel of Fortune” competition collecting their winnings from our stand. Vending Industry helps NHS England achieve 1 million reduction in Sugary Drinks! NHS England Hospital Trusts are to receive a cash boost after slashing the amount of sugary drinks they sell. Sales of sugar drinks accounted for 15.6% of drinks sold in hospital shops and vending equipment in July 2017, this was reduced to 8.7% in March 2018 in 9 out of 10 Trusts after NHS England boss Simon Stevens ordered hospital chiefs to “get their house in order”. The reduction in Sugary Drinks sold is equivalent to 1.1 million cans of Coke, 10 million teaspoons of sugar or 160 million Calories. Options Management Ltd has been helping our customers in the NHS meet these targets by offering low sugar and sugar free drinks compliant with NHS England CQUIN national goals for improving patient care. Recycling Options Brings Reverse Vending to UK Festivals! The Co-op has annouced today that it will be working with Recycling Options and Envipco to bring Reverse Vending equipment for plastic bottles to UK music festivals for the first time. 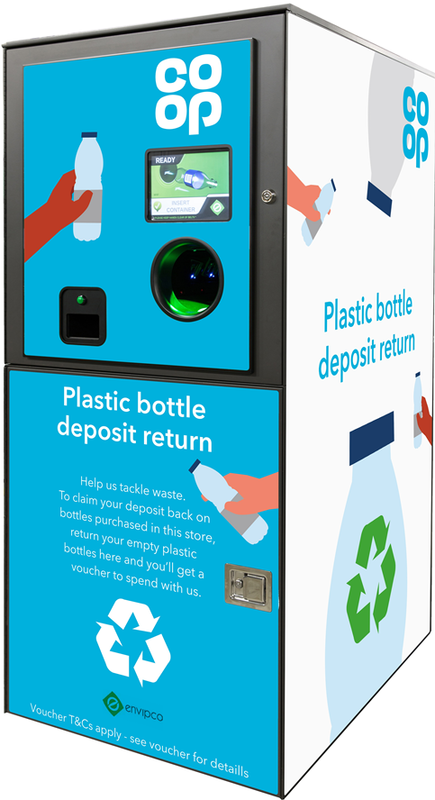 “Pop Up” Stores will be used to trial a Deposit Return Scheme for plastic bottles allowing fesitval goers at Download, Latitude and Reading and Leeds to deposite their bottle for recycling in the Reverse Vending machine and in return receive a voucher to spend in stores on-site. Please find a press release from the Co-op annoucning the move. Drink Options coffee, Live longer! Free school compliant drinks fridge! Get ready for a summer of Football with these Euro 2016 inspired cupcakes! Check out Love Popcorn, available from Options Management now!